Websight Projects, LLC Email provides fully integrated messaging, including the ability to send text messages from your desktop and receive email and calendar alerts via Desktop Notifier. You can even send and receive messages from your smartphone! • Hit the road knowing you have access to your email whenever or wherever via mobilemail.secureserver.net or use your own log in with your domain name. • Works with all the popular smart phones, such as Droid®, BlackBerry® and iPhone®. • Cut through clutter with features like message priority, highlighting, search and email filtering. 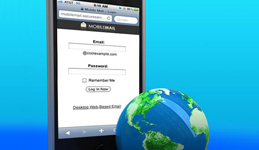 • Receive and send emails from various email addresses with a single inbox. • Desktop notifier alerts you when you receive email. 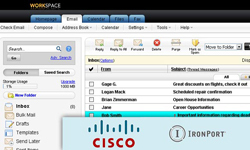 • Cisco IronPort® anti-spam program shuts out unwanted emails. 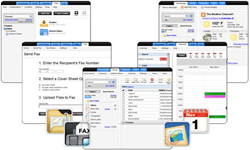 • Use the Web-based Workspace to move freely from your inbox to your Calendar, Online File Folder® and Fax thru Email (included). • Staying on task and on track has never been easier! 1 - Email account storage is limited to the following: Economy Plan 100 Email Accounts with 100 MB of storage, Deluxe plan: 500 Email Addresses with 500 MB of storage, Ultimate Plan with 1,000 Email addresses with 1 GB of storage. 2 - Plan provides unlimited storage subject to availability of space on a single clustered server. All hosting plans, including plans that offer unlimited storage, are subject to a limit of no more than 500,000 inodes per account (for Linux® hosting accounts) or 500,000 files and folders per account (for Windows® hosting accounts). Please see the Web Hosting and Virtual Dedicated Hosting Service Agreement for further details. C - PHP5 is applicable to IIS7 accounts. Allow us to help you gain new customers and keep current ones coming back with beautiful, full-color emails – no knowledge of HTML required! Built-in safeguards ensure your emails are legal and above-board all the way. Promote your business online, increase your online visibility and make money on the Internet! Allow us to step in an help you claim your share of Internet business. With in-depth research and reporting, we can guide your site in the position to boost your online exposure and move up in search engine rankings. Ask about our various packages and services for more information. Having a Content Management System (CMS) means you save yourself from the high costs of hiring a designer to do simple changes. With robust controls, the CMS gives you the power to make changes whenever, and wherever you like. All you need is an Internet connection. Each CMS is specifically designed for a company's site needs. No two are exactly alike. Create new pages. Make changes to your current ones. Remove unwanted pages. Save your changes and new pages after ironing out all the wrinkles, then make them live for all to see. Make sure your site is keeping up with today's standards. With the constant growing use of mobile devices, it make sense to have your site be readily and easily accessible through these devices. Having a mobile app for your company is one of the most popular ways to reach out to your clients and provide customer service on the palms of their hands. Don't miss out, and see how a mobile site and application can help your business. We are now offering professional photography into our list of services. The right kind of images just might be the thing you need to compliment your branding. Many sites incorporate eye-cathing photography to improve the design of their layout, why shouldn't you? Give the impression your business is meant to give.